So I didn't to TOO horrible over the weekend. I had my ONE splurge meal Saturday afternoon: cheese fries, 6 oz sirloin, 1/2 baked potato w/1 tablespoon butter and 1 tablespoon sour cream with water (3 refills). Oh, and I had one hot roll and I totally lost count of the shelled peanuts I had but I'm guessing probably a whole bag of them. That's the only part that I don't know how to count. I should have counted out my peanuts. Oh well. I'm going to count that meal as my 21 daily points plus my 36 flex points just to be safe. Then on Sunday, I had that wonderful meal planned but it didn't happen. This is what always happens. Every Sunday. I have the best of intentions and then life happens and I get derailed. Well, I hope I wasn't too badly derailed. I think I was able to keep it under control. My daughter came by (which is such a rare (well rare for me) occasion) and we took her out to lunch. In a quick decision, we decided on an Italian restaurant up the street. I know this restaurant well and even their grilled chicken is high in points. So I decided on a small plat of spaghetti with tomato sauce and 2 meatballs. Well, 1 1/2. I gave 1/2 of one of them to daughter. Other than that, I had just one small sliver of garlic bread and water (2 refills). When I got home and checked the points on restaurant spaghetti and meatballs and it said 16 points. Yikes! But not to worry, I only had 2 points for breakfast which leaves me 3 points for the rest of the day. Luckily the spaghetti completely filled me up fort he day. 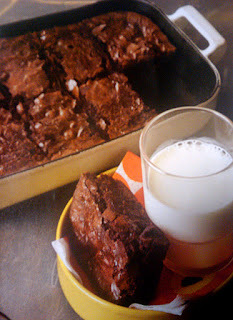 I decided to make Rocco's brownies from his new book I was telling you about yesterday. They're only 53 calories per brownie with only 1.6 grams of fat, 4 grams of protein, and 3 grams of fiber per 2" square piece. Listen to these ingredients and you'll see why it's so low in calories and high in fiber: black beans, cocoa powder, espresso powder, egg substitute, sugar free chocolate syrup, light sour cream (although I used fat free greek yogurt), Truvia and vanilla. What an odd combination but I tell you they weren't half bad! The only thing I could say as an improvement, and this was probably my fault, was that it tasted too coffee tasting. Maybe it was because I used coffee crystals rather than espresso powder. I was out and the closest store to me that sells espresso powder is 35 minutes away. I also didn't have any Truvia so I used Splenda (bad substitute!!). They really tasted like coffe/splenda brownies. I think next time I'll put real sugar in it. There's so little of it, it won't make any difference so far as calories or points go. And I have to say, mine didn't look anything the picture in the book (above). Mine had a real smooth, flat surface. They didn't look like brownies, but more like a flat, solid chocolate cake. So I ate 2 of them being as they were 1 point each and 3 points for 2 of them. Which brought my daily total to 21 points. So I would like to call the weekend a victory. When I stepped on the scales this morning, I was only up ONE pound since before my weigh in on Saturday. I'll have that off by Tuesday or Wednesday, no problem. Just a little extra walking and eating on plan all week. I tried to order that book from the library and they don't have it :( Guess i'll have to go to chapters! Good job this weekend! A definite improvement on how you say you used to treat the weekends. :) I need to try me some black bean brownies. They're all the rage with health nuts lately. Sounds like you did a great job this weekend! Give yourself a pat on the back!!!! I'm going to have to look for the cookbook in my library!!!! Who craves crispy granola bars? ?